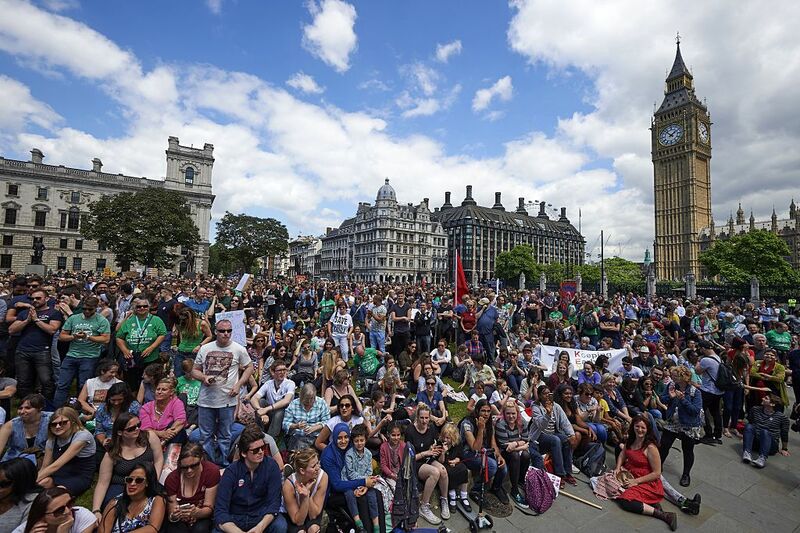 Headteacher Geoff Barton has said that headteachers are protesting in Parliament Square on Friday because “children ought to have the funding that the last generation had eight years go”. Hundreds of headteachers from England and Wales are marching on Downing Street over concerns about work conditions, pupil funding and overcrowded classrooms. Mr Barton, the General Secretary of the ASCL Headteachers Union, who will be on the march today, told talkRADIO’s Julia Hartley-Brewer: “This is a true grassroots campaign. It started in Sussex and you have got people from counties across Britain. “We are losing arts subjects for children from all kinds of backgrounds, special needs children are not getting teaching assistants because the only thing you can do if there are real term cuts is to lose staff. “Enough is enough and if you were a parent and I was a headteacher I would like to think that you would think ‘he is going down and trying to do something’. Around 1,000 headteachers from England and Wales are due to march on Downing Street today to demand extra cash for schools. The campaign Worth Less? calls for more money to tackle issues such as overcrowded classrooms, staff recruitment, the problem of low staff retention and poor working conditions. Shadow education secretary Angela Rayner has voiced her support for the protest. She said: "This unprecedented action by headteachers is a clear sign of the desperate struggle they now face to provide a decent education while balancing the books. "It is time that ministers listened to the clear message from communities across the country that they have had enough of cuts to their schools." Julia Hartley-Brewer then asked why this rally had not been organised for the six weeks holiday, when school was not on. Mr Barton said: “I think parents will be reassured that what is happening in classrooms is that teachers will be there teaching their children. “I think the reason the organisers have probably chosen now is that this is the time that we are moving towards the budget. “The budget is starting to be prepared and we are moving towards a comprehensive spending review. “Frankly, we spend a lot of time waiting for the government to make some announcements. “It was the first day into the holidays when they announced the teachers’ pay award. Mr Barton added: “I think there is a real sense from a very moderate group of people that we cannot continue to make cuts in our schools and not say that these have got real consequences. “A society with the sixth biggest economy has to say let’s invest in young people. “I was a headteacher for fifteen years and the only way you can make the kind of cuts you have to make, which are £150,000 a year year-on-year, is by losing staff. “It means bigger class sizes, it means losing the kind of subjects that you would pay for child to do in an independent school.